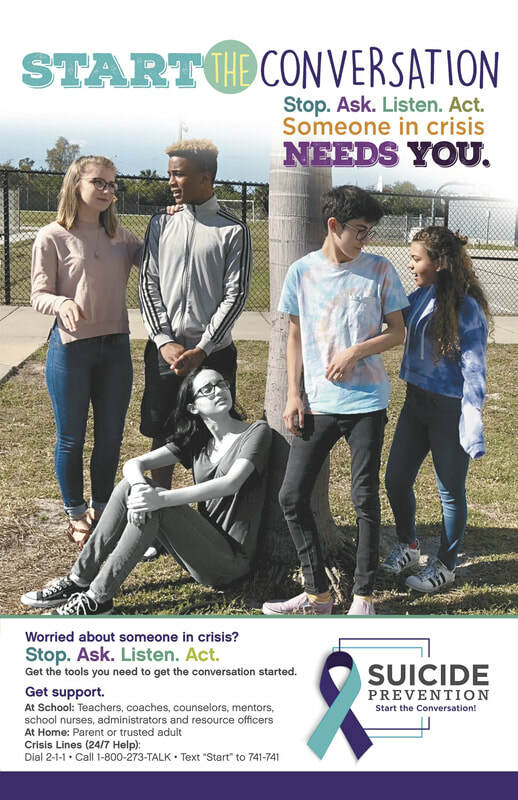 In March 2017, over 30 community leaders led by Liz Mikitarian, Vice President of the Hannah’s Heroes Teen Suicide Prevention and Lori Duester from The Children’s Center, a service of Parrish Healthcare, and the Sources of Strength Teen Suicide Prevention Program, formed the Youth Mental Health Task Force (YMHTF) to reduce the rate of teen suicides and suicide attempts by taking a comprehensive countywide approach. ​Click Here to watch YMHTF's PSA. Click Here to read the YMHTF's introduction article. Photos from 3.17.18 Out of the Darkness Walk & Sources of Strength Carnival. If you or someone you know is in crisis, please dial 2-1-1 (Brevard County), call 1-800-273-TALK (8255), or text START to 741741!